We love dipping foods, whether it’s chocolate fondue or chips and salsa, because it’s just more fun that way. And what is more fun and romantic than dipping luscious strawberries into thick, rich, hot chocolate? Not many things I can think of! This recipe from Gale Gand is reminiscent of Mexican style hot chocolate, flavored with vanilla bean, coffee, and canela, the Ceylon type of cinnamon with a looser bark and citrus overtones. The base is heavy cream and whole milk stirred with bittersweet chocolate, but it’s not dark due to the presence of 2-1/2 cups of dairy. I took it very slowly, stirring the mixture while waiting for it to come to a boil, them reduced the heat and simmered for just a few minutes while it thickened. When it was ready, we dipped strawberries, banana slices, and…animal crackers. Yes, we borrowed from the kids’ stash! It was a little whimsical and a cute way to remind us that we are indeed, parents. It’s also good with homemade marshmallows, and I’ve posted links to some good marshmallow recipes at the end. Chocolate fondue requires low heat so that the chocolate doesn’t burn, and it works best in ceramic containers set over a tea light. A basic pot set costs around $20 with the pot, stand, and some forks, though I lucked out last year and found a nice chocolate fondue set for two for just $6 at Ross after Valentine’s Day, so be on the look out for bargains. The recipe makes enough to serve four people, so cut it in half if you are making this for a romantic dessert for two. Adapted from Chocolate & Vanilla, by Gale Gand. In the medium bowl, whisk together the sugar, cornstarch, coffee, and canela. Slowly stir in the cream and milk. Pour mixture into the heavy pan and add the cut vanilla bean. Slowly bring to a boil over medium heat. Watch it carefully so that it doesn't boil too fast, otherwise it will scorch. As soon as it reaches a boil, turn heat back to medium-low and simmer for about 4 minutes, whisking constantly. Mixture will thicken. Remove from heat and stir in the chopped chocolate and the butter until both are melted and fully incorporated. Pour into the fondue pot and set over a tea light. Serve with dippers. I really like the addition of coffee here. Adds an extra kick for sure! How’d you know I was craving chocolate fondue? I’ve never added cinnamon to mine, which is weird because I love cinnamon & chocolate together! Meeta, it does add a little kick, plus that bit of flavor that is very nice! Lisa, I love the cinnamon & chocolate combination, too! 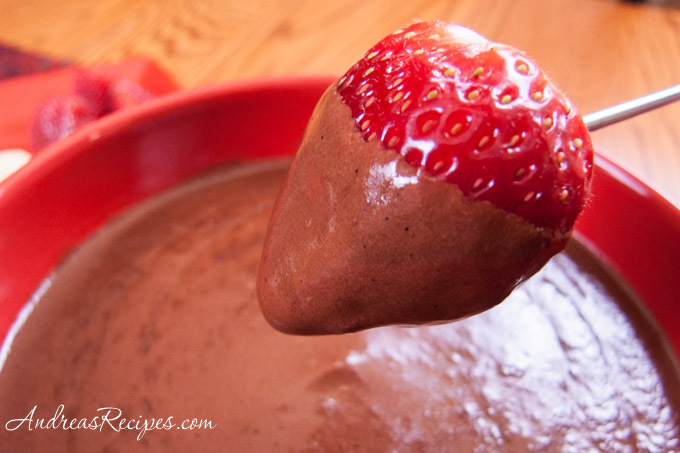 Enjoy yourself some chocolate fondue for Valentines Day! This sounds soo yummy and not too complicated to make! My husband is allergic to coffee, how do you think it would taste if I left out just the coffee? Oh I would love to make this just for myself–yum! Ooohhh, the addition of coffee ( or a shot of espresso in our case) is a great idea. I tried chocolate one time, but It burned. What a waste of chocolate! I was scared ever since, but with the coffee I’ll give it another try.